I considered putting the Robot Devil on my list but I don't want the Robot Gods to be angry with me. I would have used that clip except that's actually Alpha 12! Totally different robot! I haven't seen Lost in Space color episodes since the late 70s. That was the last time the local station that had the rights to the reruns aired it, and no other local station picked it up. Never got around to watching it on cable even though it was once one of my favorite shows. I didn't remember both IDAK's using the catch phrase "Crush Kill Destroy", but I guess that is the first thing an IDAK says to anyone dumb enough to activate it. Also, for some reason I remembered the Alpha being gold and Omega being silver so you could tell them apart when they finally battled each other. But basically the android in the clip is no different than the Omega, other than it doesn't become friendly two minutes after meeting Dr Smith. I recall the Omega beating the Robot unconscious, and attacking the Jupiter 2. I think IDAK was short for Injur Destroy and Kill. Clamps works directly under the Mafia leader Donbot, which would be impressive, though it looks as though the Robot Mafia consists of exactly three robots, so maybe it isn't so impressive. They're robots, so they are much more efficient. I've seen them in action. I have my doubts. Maybe... unless the phones look like this. You're champin' for a clampin'!! Trimaxion Drone Ship, or Max, is a sentient spaceship that appears in the movie "The Flight of the Navigator". Max is from the planet Phaelon, and his mission is to find animal specimens, take them to Phaelon for study, and then return them safely home. During one mission, Max takes a young boy named David. However, when he is returned, 8 years have passed due to the time dilation of space travel (from David's perspective, it was only a few hours). Not long after, Max reunites with David, who reveals he filled Max's head with star charts. Unfortunately, Max recently crashed and has lost all that information, meaning he needs David to act as navigator. Max would go on to gain a very human personality after having psychic contact while transferring David's star chart data back to himself. Trivia It was Paul Reuben's idea to make the identity of the actor providing the voice of Max a mystery and he was credited as "Paul Mall". 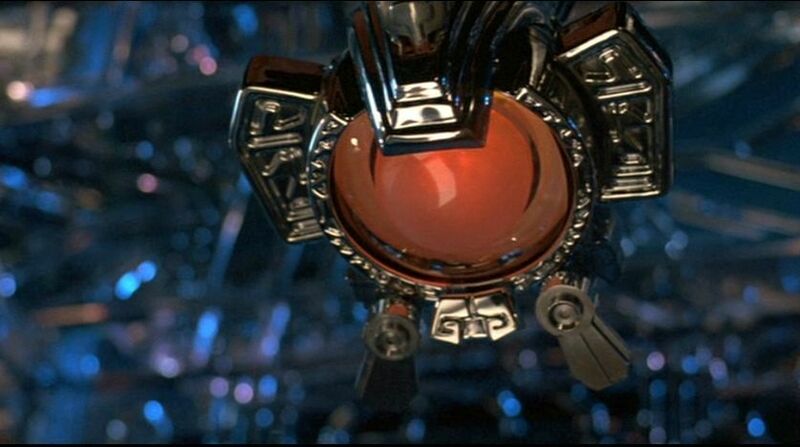 Flight of the Navigator is definitely the best childrens sci fi movie of the 80s. It's amazing that Disney was able to produce such a movie which was different from their usual schlock. I'm happy that someone else also put Max on their list. The Last Starfighter would like to have a word with you. But yeah, I was a big fan of Flight of the Navigator as a kid. If I had gotten around to submitting a list, I hope I would have remembered Max. H.E.L.P.eR. is a robot who appears in the animated series "The Venture Brothers". H.E.L.P.eR. stands for Helpful Electronic Lab Partner Robot (with the extra 'e' for aesthetic purposes). He was created by the brilliant adventuring scientist Dr. Jonas Venture to act as a nanny for his son, Rusty. Rusty grew up into a scientist in his own right, albeit one with countless insecurities and neurosis from living in the shadow of his father. H.E.L.P.eR. would go on to act as the nanny of Rusty's sons Hank and Dean. While Rusty treats H.E.L.P.eR. rather poorly, he went onto discover that H.E.L.P.eR. has actually developed human emotions. He is treated well by Hank and Dean, as if he were a member of the family. Possibly due to his age, H.E.L.P.eR. is often very clumsy and easily confused. He speaks in a series of synthwave sounds that the Venture clan seem to be able to understand (most notably the family's bodyguard, Brock Samson, who is the only one who seems to have extended conversations with him). Trivia H.E.L.P.eR. is voiced by Soul-Bot, which is co-creator Christopher McCulloch (AKA Jackson Publick) with his voice put through audio filters. Soul-Bot is actually given a backstory where he lives on Astro-Base Go!, was created by children and is powered by absorbing love. That's it for tonight! Three more tomorrow! I dig the Aquabats! I learned of them thanks to Mega64.